Pope Francis endorsed our Catholic Climate Petition! May 5, 2015 – Pope Francis endorsed the Catholic Climate Petition after meeting with a group of representatives of our Global Catholic Climate Movement (GCCM) in the Vatican. Through the petition we are collecting signatures from Catholics all over the world to raise a strong voice demanding bold climate action. The petition signatures will be presented to world leaders in December 2015, when they will meet in the United Nations climate summit at Paris with the goal of signing a treaty to tackle climate change. Left: Pope Francis is informed about the Catholic Climate Petition by GCCM representatives (Tomás Insua from Argentina and Allen Ottaro from Kenya). 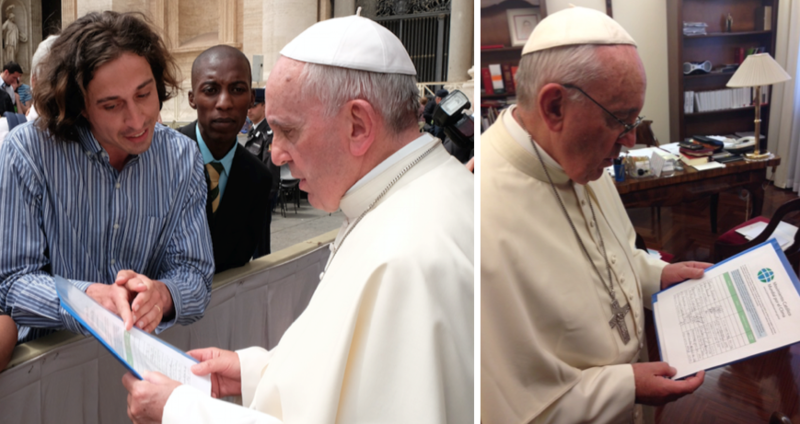 Right: Pope Francis holds the Catholic Climate Petition in his personal office. Credit: Fotografia Felici. Pope Francis asked the Pontifical Ceremonieri, Monsignor Guillermo Karcher, to sign the petition on his behalf as a way to show his endorsement (given that popes don’t sign petitions because of protocol). Left: the Pontifical Ceremonieri, Monsignor Karcher, signs the petition on behalf of Pope Francis. Right: the signed petition in Spanish (note that he friendly put @pontifex_es as his Twitter handle). Credit: GCCM. The Pope also gave GCCM the book “The Sun’s Energy in the Vatican” as a gift, to emphasize the Holy See’s commitment to renewable energy as a means to address the climate change crisis. All the pictures about the meeting are available here. 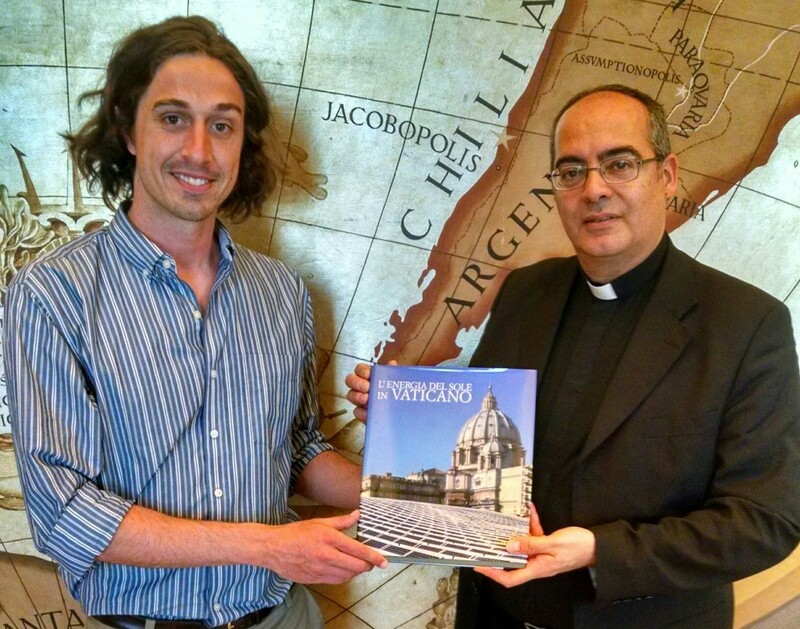 Monsignor Karcher gives the book “The Sun’s Energy in the Vatican” as a gift to GCCM on behalf of Pope Francis.